Pyramid Black Nylon Tapewound Strings – Play UBass! A big thanks to Dean at ubassappreciation society for your blog post about my recent string review! Pyramid Strings’ new Black Nylon Tapewounds for uBass. Our friend Magnus Sjöquist over at PLAY UBASS! 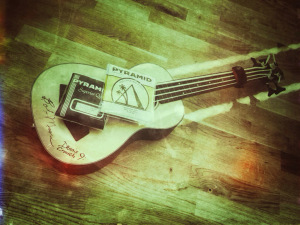 has done a pretty thorough review of Pyramid’s new Black Nylon Tapewound strings on his fretless uBass. These strings are not to be confused with Pyramid’s copper-wound tapewound strings, these are new. Do not buy, I did and they are completely out of tune! I have a fret less Mahograny Ubass2, my amp is a TC electrońic and It has a chromatic super accurate tuner in it. The strings starting from the second ”freet” we’re out of tune, by fret 12 the difference with the lines at the fingerboard were of about 1/4 tone’!! The color of the strings is ok but the tune is a mess. As I wrote in my review there are some problems intonation wise that really has to be fixed before these strings are a serious alternative to the other seeing a on the market. I will try to help to do some more testing and hopefully there will be an updated set available in the future!